We are sad to report the passing of our long-time friend and neighbor, Walter “Tink” Seymour. Tink died Saturday morning, September 8, at his home. He was a good friend and neighbor, known for his patrols of the neighborhood, checking on everyone’s homes and well-being. We will announce funeral details when they are available. The odds of a major hurricane making landfall along the East Coast next week keep growing. Forecast models paint an increasingly grim picture, converging on a track that would have what is currently Tropical Storm Florence making a direct hit as a powerful hurricane somewhere along the Southeast coast. The National Hurricane Center predicts a dangerous major hurricane near the Southeast coast by late in the week. Potential U.S. landfall is still several days away — probably between Thursday and Friday, September 13-14— and Florence’s ultimate track and intensity are not yet set in stone, with still a small chance that it meanders just off the East Coast and then curls out to sea. Here is the latest track from the National Hurricane Center. You should begin to make preparations for a major storm. Even if Florence does not hit us directly, we likely will get high winds and heavy rain — wind speed, rain amount and storm duration will depend on where the storm makes landfall. Ensure all doors and windows are securely closed and locked. Tie down or store all outside items — lawn furniture, grills (both charcoal and propane), boats, anything else normally in the lawn or on the deck should be put inside, under your deck, or tied down securely. Ensure your boat is well-secured to the lift. Or, better yet, take the boat out of the water and park boat on trailer. If you have propane, check your tank level and top it up if it’s below 40%. If you have a generator, check it — check oil, check fuel supply, make certain it starts. If you will be in the neighborhood when the storm hits, you should stock up on perishables — milk, bread, other food — the local Food Lion likely will run low beginning a few days before the storm hits. KEEP TRACK OF THE STORM: Watch this website; check local TV and radio; check the National Hurricane Center website. You do not need to stock water. Our water system has a generator that will keep the pumps running in case of power outage. We will watch the storm and update the website. Meanwhile, here’s a satellite photo showing Florence plus two other tropical storms that likely will develop into hurricanes. Here is the latest track projection for Hurricane Florence by the National Hurricane Center. We will monitor Florence and provide regular updates on this website. If it appears that Florence will affect our neighborhood, we will provide information to property owners via email. By 2 AM Tuesday, Sep 11, Florence is projected to be a major hurricane with winds over 110 MPH. This track indicates Florence could make landfall along the NC-SC coast late on Thursday, Sep 13, continuing into Saturday, Sep 15. Landfall on the NC-SC coast. This image shows “spaghetti models” for Florence as well as for a newly-formed tropical depression and a new tropical storm, both off the west coast of Africa, possibly headed for the US, the Caribbean, or the Gulf of Mexico. Note, too, some possible tracks for Florence show the hurricane either (1) making landfall along the NC-VA coast; (2) along the VA coast; or (3) veering to the North or Northeast, missing the US East Coast. As of Wednesday evening, September 5, Hurricane Florence is located in the Atlantic and likely will make landfall on Bermuda. Some projections show Florence making landfall in our area late next week (Sep 10 – 14 or later). Here are maps and satellite photos. This satellite photo shows Florence as of 7:42 PM EDST, September 5. 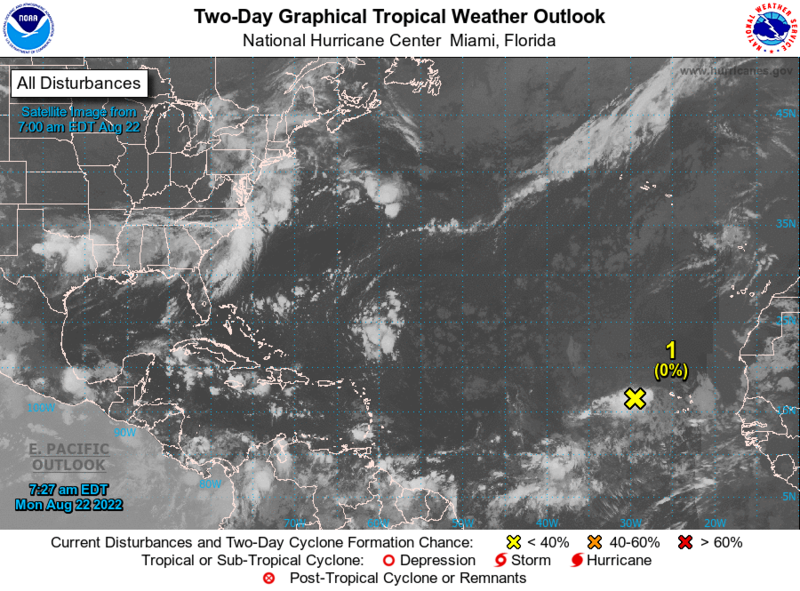 Note also another tropical depression has formed off the coast of Africa with 70% chance of developing into a tropical storm within 48 hours. This graphic from the National Hurricane Center projects that Florence will grow into a major hurricane by Thursday, September 6, and will be in the vicinity of Bermuda by Monday afternoon, September 10. Major hurricanes are defined as those with sustained winds over 110 MPH. 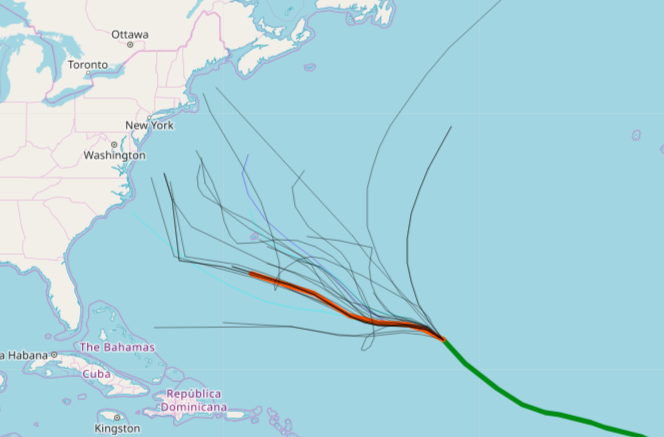 This graphic from WeatherModels.com plots several possible tracks for Florence. Note that several of these possible tracks indicate Florence could make landfall on the US East Coast somewhere between north Florida/south Georgia and the Chesapeake Bay. Other tracks project Florence avoiding the East Coast and turning sharply northeast into the North Atlantic. We will monitor Hurricane Florence and will post updated information over the next few days. Here is a link to the National Hurricane Center where you can monitor Florence as well as other tropical storms or hurricanes. This graphic from the National Hurricane Center shows Florence weakening to tropical storm status Thursday and Friday, then strengthening to hurricane force, becoming a major hurricane by Tuesday night, Sep 11. Here are spaghetti models for Florence’s future track. This spaghetti model accompanies a Newsweek article on Florence. All Potomac Bay Estates property owners are invited!! Bring the family !! Children and dogs are welcome. Rain date: Sunday, Sep. 2, same time, same place. The Property Owners’ Association will provide the meats – buns – condiments — bottled water and soft drinks. There are no jellyfish in the water this year, so, bring swimsuits, kayaks, and other water gear. We had a small but really fun neighborhood picnic on Saturday, September 1, at the picnic area. Five couples attended: Michelini, Ross, Houser, Williams and Schlatter. PBE POA President Dave Williams presented Sue and Ray Michelini with an original painting by our own late Carol Seymour in recognition of their service to the POA. Ray served as POA President and Board member. He also guided the beach restoration/bulkhead protection project that resulted in our new breakwaters and observation deck. Here are suggestions from some of our neighbors of places and events you may enjoy. Greg Howell – the Shaggin’ DJ spins Shag and Line Dance tunes beginning at 6:30 and continuing until 9:00 each Thursday. Shag Beginners – 6:00 – see Earl Barton or Ray Paul to request a lesson. KC’s Crabs and Cues is located at 10468 Jesse DuPont Memorial Hwy — that’s Hwy 200 — from our area, go to Burgess, turn right at the light onto Hwy 200/Jesse DuPont Memorial Hwy; continue 10.4 miles to KC’s on the right. Friday Night – Bob Wilson is playing at Good Luck Cellars from 5:30 – 7:30. Byrds Seafood truck has begun to sell food every Friday night also. Good Luck Cellars is located at 1024 Goodluck Road, Kilmarnock. from our area, go to Burgess, turn right at the light onto Hwy 200/Jesse DuPont Memorial Hwy; continue 10 miles to Goodluck Road on the right; turn onto Goodluck Road, go 1.5 miles to Good Luck Cellars vineyard on the left. We enjoy the people, food and drink as often as we can and hope folks that live and visit the PBE will attend when they can. It’s a good time!